“New Stuff” from Twain’s California Days? Before Mark Twain was run out of California on a rail to eventually embark on a new life in which he was revered as America’s best loved humorist, he honed his writing skills contributing to a variety of newspapers, one of which was the Sacramento Union. 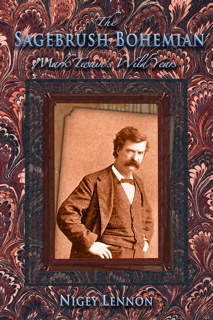 Although the original newspapers in which these articles appeared were destroyed by fire, outraged subjects, and random events of time, the staff at the Mark Twain Papers project at UC Berkeley claims, as usual, that they’ve been hard at work researching their appearances in other publications of the time, and have come up with “new stuff” written by Twain for the Union. We presume this doesn’t indicate that the new stuff was composed recently. Be that as it may, AirStream author Nigey Lennon read much of Twain’s Sacramento Union correspondence while doing original research for her biography, The Sagebrush Bohemian: Mark Twain’s Wild Years (the first Twain biography to focus on his literary apprenticeship on the West Coast). This was, ahem, in 1980.